Organ and tissue donation is the process of recovering organs and tissues from a deceased person and transplanting them into others in order to save or enhance the lives of those in need. Up to eight lives can be saved through organ donation, and dozens more lives may be improved through tissue donation. What organs and tissues may be donated? Transplantable organs include the kidneys, liver, heart, lungs, pancreas and intestine. As for tissue, skin is used as a temporary dressing for burns, serious abrasions and other exposed areas. Bone is used in orthopedic surgery to facilitate healing of fractures or prevent amputation. Heart valves are used to replace defective valves. Tendons are used to repair torn ligaments on knees or other joints. Veins are used in cardiac by-pass surgery. Corneas can restore sight. How many people need donated organs and tissue? Today, nearly 120,000 children and adults await life-saving organ transplants. More than 5,000 of them are listed at transplant centers in Florida. In addition, hundreds of thousands more wait patiently for the gift of tissue donation. Every day, approximately 22 people die while waiting for an organ transplant. Under what circumstances can a person be an organ donor? In almost all cases resulting in organ donation, the patient has suffered a traumatic brain injury and brain death. After all life-saving efforts have been exhausted, and it is determined that the patient’s death is imminent, the patient must remain on ventilator support. The reason for this is the heart and lungs must continue to function after the patient dies so that the transplantable organs continue to function. Once the heart stops beating, organs begin to shut down, limiting their viability for life-saving transplantation. Under what circumstances can a person be a tissue donor? Virtually all deceased persons, regardless of cause of death, may potentially be tissue donors. Unlike organ donation, it is not necessary for heart and lung function to be maintained on a ventilator. Once a death is reported to the tissue agency, protocols require the family be contacted within several hours regarding the opportunity to donate. Under what circumstances can a person be a cornea (eye) donor? The great thing about eye tissue is that everyone is a universal donor. Your blood type does not have to match. It doesn't matter how old you are, what color your eyes are, or how good your eyesight is. Aside from those suffering from a few highly communicable diseases such as HIV or hepatitis, most people are suitable donors. Even people with cancer can be cornea donors. Corneal tissue may be completely healthy even if the donor's eyesight was poor. Most major religions approve of organ, tissue and eye donation, and consider donation an act of charity. If something should happen to me while I am traveling, what role does my registration play? All matters concerning organ and tissue donation are under the jurisdiction of each state’s or country’s respective laws. 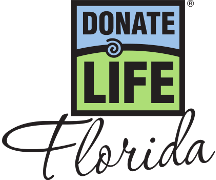 While your registration will not serve as legally binding consent for donation outside Florida, it will serve as a clear indication of your wish to donate and will be shared with your family when they are approached by the local organ recovery organization. Will donation affect funeral arrangements? No. Great care is taken to preserve the donor's appearance, and the donor's body is treated with respect at all times. Funeral arrangements, including a viewing, if desired, may proceed as scheduled. How do you determine who receives the organs? Organs are allocated nationally based on a complex medical formula established by transplant doctors, public representatives, ethicists and organ recovery agencies. UNOS (the United Network for Organ Sharing) maintains the list of patients waiting for transplants. A donor's blood type, tissue type, body weight, and size are matched against patients on the list. If there are multiple matches, priority is given to the sickest patients, or in the case of kidneys, those who have been on the waiting list the longest. Factors such as race, gender, age, income or celebrity status are never considered when determining who receives an organ. How can my organs and tissues be used for research? Organs and tissues not recovered for transplant may be recovered by the local organ, tissue or eye recovery programs for pre-approved medical research if the donor (or family, in lieu of a registry record) authorizes such. All research projects are carefully evaluated by the donor programs, and only those projects that offer clear medical benefit and are administered by experienced, reputable organizations are approved. What if I don’t want my organs and/or tissues to be used for research? Donated organs and tissues may be used for two purposes: transplantation and medical research. The Joshua Abbott Organ and Tissue Donor Registry allows you to opt out of donating organs and/or tissues for research. During the enrollment process, check off the “Donation Limitations” box and check the “For Research” box under both Organs and Tissues. If you have already enrolled online or via the driver license or tax collector office you may go to the Registry website, click on Update My Donor Profile, enter your login information, and then specify donation limitations. While updating your profile you may also change your password and personal information or remove your name from the Joshua Abbott Organ and Tissue Donor Registry. If I am registered as a donor, will my medical care be affected? Medical care is not affected in any way by your status as a registered donor. Every attempt is made to save your life. In fact, patients must receive the most aggressive life-saving care in order to be potential organ donors.